Eho-Altissa was a German camera maker based in Dresden. The company started in 1892 as Richard Knoll's "Photo Spezialhaus" in Leipzig. Since 1904 it started repairing and manufacturing photographic supply. In 1910 it moved to Dresden. In 1927 it was taken over in by Emil Hofert and later continued by Berthold Altmann. In the early 1930s the company was successfully making box cameras. 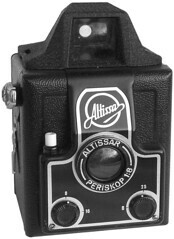 The mechanician Karl Heinrich Altmann created the unique "Altissa" box camera line. The company's cameras were sold under brands of warehouses and photo suppliers: Adina (Kaufhof), AKO, Arto, Beier, Errtee (Romain Talbot, Berlin), Fotam, Fotka (Czech), Hamaphot, Hermax, Mantel, Mono, Nebo, Rhaco, RECORD, Rilo, Staufen, and Wara. In 1937 the company launched its only reflex camera Altiflex, and in 1939 its sophisticated 35mm viewfinder camera series Altix. The company's name was changed several times: EHO-Kamerafabrik GmbH (1931), Amca Werk Berthold Altmann (1940), Altissa Camera Werk (1941), VEB Altissa Camera Werk (1952). In 1950 it was still a private company, having 160 employees. But Berthold Altmann decided to move to Western Germany. In absence he was condemned by East-German justice, and as consequence his company was taken over by the Socialist East-German state. From 1959 it was part of VEB Kamera- und Kinowerke. The production of its cameras was ceased in 1961. A license production of the Altix VI cameras was launched in Sarajevo (Yugoslavia) with the original production equipment from the abandoned German factory.